The majority of Fabry patients have kidney involvement (nephropathy), with significant proteinuria and progressive loss of kidney function leading to end-stage-renal-disease. 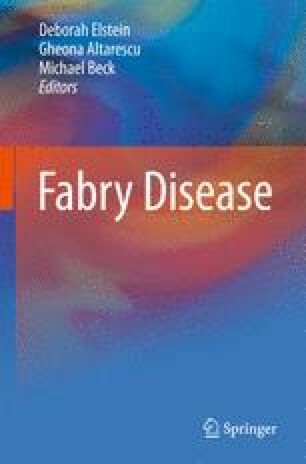 Baseline assessment of the severity of Fabry nephropathy, institution of appropriate therapy, and close monitoring of the subsequent course is essential. Once present, target kidney damage is not reversed, so stopping further progression is the treatment goal. Fabry nephropathy is treatable, even in patients with fairly advanced disease. While the cornerstone of therapy remains enzyme replacement therapy with agalsidase preparations, this treatment alone does not reduce urine protein excretion. Treatment with angiotensin converting enzyme inhibitors or angiotensin receptor blockers must be added to enzyme replacement therapy to reduce urine protein excretion with the goal that this will stabilize kidney function. Kidney function, with estimated glomerular filtration rate based on serum creatinine, and measurements of urinary protein should be obtained at every clinic visit, and the rate of loss of function followed over time. Anti-proteinuric therapy can be dosed to a pre-specified urine protein target rather than a specific blood pressure goal, recognizing that successful therapy will usually lower the blood pressure below the goal of 130/80 mmHg used for other forms of kidney disease. The overall goal for treating Fabry nephropathy is to reduce the rate of loss of glomerular filtration rate to ≤ −1.0 ml/min/1.73 m2/year, which is that seen in the normal adult population.